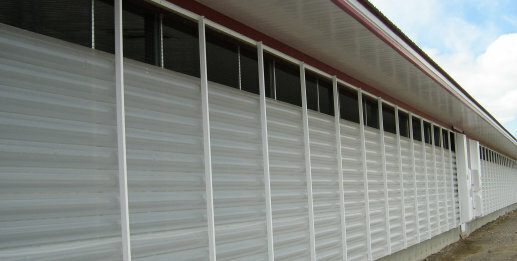 The air curtains are specifically designed for barns and livestock buildings. You can rely on them to provide a constant temperature and low humidity for your animals, even in the most extreme weather. The curtains are made of horizontal tubes of flexible material which are filled with air using blowers. By switching the blowers on and off, sections of the wall can be raised or lowered to control the temperature and humidity inside the building. The blowers can be controlled manually, or automatically as part of a total building ventilation system. SECCO ventilation systems are designed and built in Canada and are being used successfully across North America and mainland Europe. This video shows a selection of SECCO installations across the world. Please call us to discuss your ventilation needs in more detail, so we can recommend the best products for your situation. 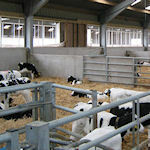 See pictures of air curtains in use on farms across the UK.